Bantamweight Brit Jamie McDonnell is on the verge of his biggest fight to date as he travels to Tokyo, Japan, to defend his WBA Bantamweight Title against the highly rated Naoya Inoue. The Doncaster man proceeds his “road warrior” reputation once again with his sixth appearance overseas. This time provides a heightened challenge, as Inoue is rated in the pound for pound list following world titles at two different weight divisions; knocking out 13 opponents in his perfect start to a 15-fight career. McDonnell also an impressive record to boast, although it seems to go under the radar amongst the Boxing world. In a 10 year undefeated spell, the Bantamweight has earned British, Commonwealth and European honours before picking up WBA and IBF world titles. This fight provides a huge challenge, a reward of the much deserved recognition and a potential spot in the lucrative World Boxing Super Series. With such high stakes, Jamie has taken no stone unturned in a meticulous training camp under head trainer David Coldwell and the Boxing Science team. The good times have been rolling at Coldwell Boxing gym, with big wins coming for Jordan Gill, Anthony Fowler, twin brother Gavin and most recently Tony Bellew dispatching David Haye for the second time. Alongside his boxing training, Jamie has utilized the team of sport science experts – Boxing Science from Sheffield Hallam University. Strength and Conditioning coach Danny Wilson, physiologist Dr. Alan Ruddock and Sport Nutritionist Dr. Mayur Ranchordas. The Boxing Science team normally offer strength training, physiological testing, high-intensity interval training and effective weight-making strategies. However, travelling almost 6000 miles to a country with an 8-hour time-difference provided an extra task for the team. To help effective Boxing Science put together an effective time-zone shift strategy, which included a two-week training camp in Dubai en-route to Japan. 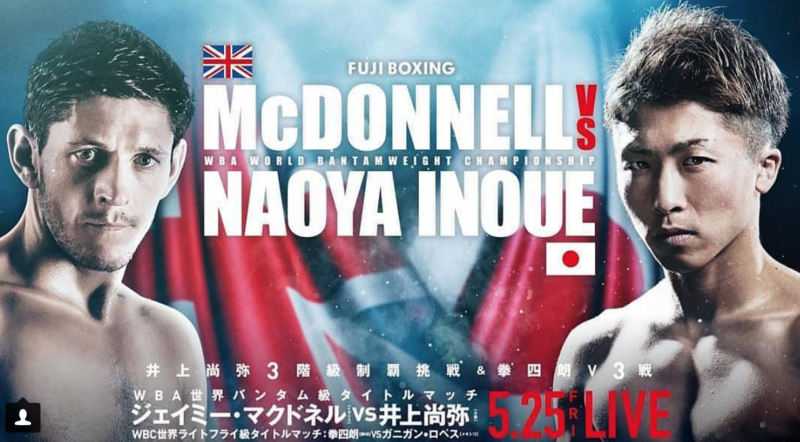 McDonnell is looking to establish himself as the world’s top Bantamweight and a victory over the undefeated Inoue would go a long way towards that. Experience is on McDonnell’s side, with the Englishman having 32 professional fights to Inoue’s 15, including six previous defences of his World Title. When asked what would make the difference in the fight, Jamie told us: “When he squares up to me in the ring and sees the size of me, I think that will be a huge factor. “You also need the will to win and I want it bad. I think Inoue thinks that he will walk through me and he won’t prepare as hard as I will. His fights never go the distance, but I’ll be preparing for 12 hard rounds. McDonnell has fought abroad a number of times throughout his career and is unfazed at the prospect of flying to Japan for the bout. “This fight means the world to me, I believe that it will be a career-defining fight. The World Boxing Super Series has just been announced and I am keen to get in that. But I know in order to be involved I must beat Inoue – so I’m solely focused on the task in front of me.